If you could take any of my classes which one would it be? Check out my workshop page and also look at my patterns page and tell me which class you would like to take or pattern to make in class. On Sunday I will send one lucky winner picked from random numbers.com to get a free 1/2 half yard of hand dyed fabric, just because you told me your thoughts. Working with a timed would be a good class, and looking at patterns, the seaside cottages would be my fav, but it is not a pattern! Alas! Liking the rambling rose quite a bit, too. Working with Timtex….darn that auto correct! I would like to take the Laughing Leaves class, especially if you teach composition so that every student’s results don’t look exactly like yours. I was just thinking about you yesterday, wondering how you are doing without George. I would choose the lecture about walks in the woods with George. (Have already taken your fee motion quilting class.). My favorite pattern has always been Duluth trees. Love it! 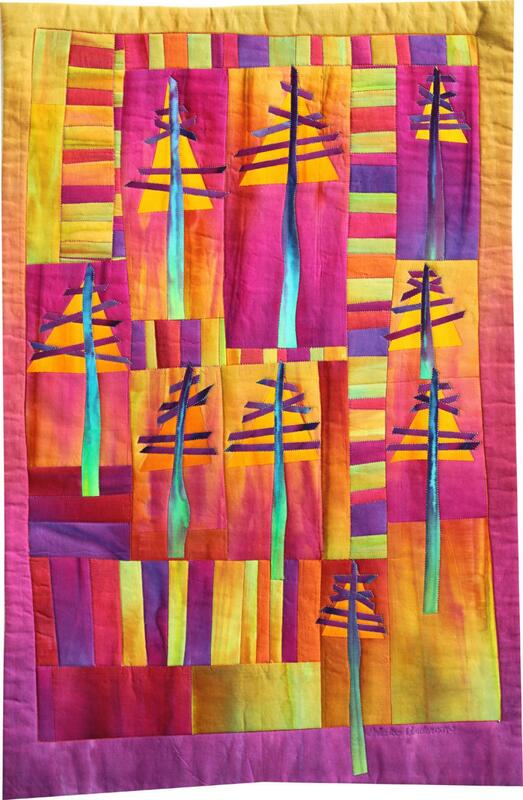 Definitely the free motion quilting class — I have just started to get more comfortable with that and would love to get better — and your talent is something to strive for! I have always loved Aspen Leaves, and your Dye Class would be to die for. Limiting myself to three: Autumn Mums, Trumpeting Spring (daffodils have always been a favorite) and would beat feet to any class featuring those terrific beach houses! I would love to attend a lecture on how you dye fabric. your dyeing class is definitely on my bucket list. Have been wanting to try dying fabric for a long time…. Since I’ve already taken your Craftsy free motion class, and I’ve already taken your Sister Trees (so graceful and curvy! ), I would take your Blue Daisy class. Pretty! Working with Timtex gets my attention! I also love Duluth Trees. I would love to try your dying class. That is something that has always intreged me. I love your autumn mums pattern. It looks so beautiful and would look great hanging on a wall. I would love to take a class with you on seaside houses. I have always loved your leaves patterns. They look like so much fun and the color gradations are wonderful. I’d also like the Autumn Mums…a spot of wonderful color in the midst of winter. I would love to do the Christmas Morning pattern for a class–awesome….